Nowadays, our solution to the GBVP by the finite element method (FEM) is performed in the FEM software ANSYS. Since, we are limited by the number of elements, we can only perform local finite element solutions with the limited resolution. Here one can download the source file with a very coarse resolution just to illustrate the way of implementation in ANSYS. It is a disturbing potential solution in the area of central Europe (Download). The goal of this paper is to present the finite element scheme for solving the Earth potential problems in 3D domains above the Earth surface. To that goal we formulate the boundary-value problem (BVP) consisting of the Laplace equation outside the Earth accompanied by the Neumann as well as the Dirichlet boundary conditions (BC). 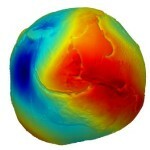 The 3D computational domain consists of the bottom boundary in the form of a spherical approximation or real triangulation of the Earth’s surface on which surface gravity disturbances are given.We introduce additional upper (spherical) and side (planar and conical) boundaries where the Dirichlet BC is given. Solution of such elliptic BVP is understood in a weak sense, it always exists and is unique and can be efficiently found by the finite element method (FEM).We briefly present derivation of FEM for such type of problems including main discretization ideas. This method leads to a solution of the sparse symmetric linear systems which give the Earth’s potential solution in every discrete node of the 3D computational domain. In this point our method differs from other numerical approaches, e.g. boundary element method (BEM) where the potential is sought on a hypersurface only. We apply and test FEM in various situations. First, we compare the FEM solution with the known exact solution in case of homogeneous sphere. Then, we solve the geodetic BVP in continental scale using the DNSC08 data. We compare the results with the EGM2008 geopotential model. Finally, we study the precision of our solution by the GPS/levelling test in Slovakia where we use terrestrial gravimetric measurements as input data. All tests show qualitative and quantitative agreement with the given solutions. Our aim is to introduce the Coupled Finite-Infinite Element Method (CFIEM) as a new alternative approach to the Earth’s gravity field modelling. We show that if the computational domain is large enough in radial direction, one can obtain the qualitatively and quantitatively comparable solution to the solution by the Finite Element Method (FEM). We study the influence of the size of the computational domain on the final CFIEM solution as well as the successive refinement of the discretization and its convergence to the exact solution. As an input data we use the synthetic boundary conditions computed from a Synthetic Earth Gravity Model (SEGM) and we test the CFIEM solution by the data generated directly from SEGM and the solution by the FEM.